The University of Technology in Jamaice (UTech) launched the “Caribbean School of Sports Science,” a department developed with cooperation from the United States Sports Academy, in a ceremony on its campus in Kingston on 23 June. Professor Errol Morrison, the President of the University of Technology (left), met with Academy Vice President Dr. T.J. Rosandich during his recent visit to Kingston, Jamaica. In September 2009, a delegation from UTech visited the Academy campus and a protocol between the United States Sports Academy and UTech was signed. UTech had sought advice and direction from the Academy in establishing a national school of sport to serve the entire Caribbean basin. 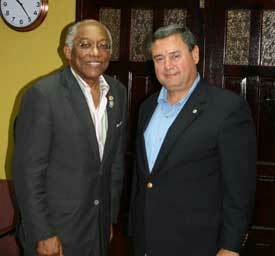 The delegation visiting the Academy was led by UTech’s President, the Honorable Professor Errol Morrison. Also in the party during the signing were Director of Sport Anthony Davis, Dr. Colin Gyles, Faculty of Science and Sport, and Dr. Neville Graham, Curriculum Consultant.